Game three. 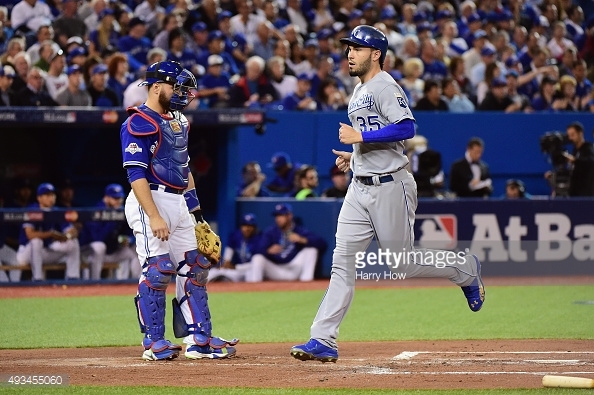 Down 2-0 in the ALCS series against the Kansas City Royals. 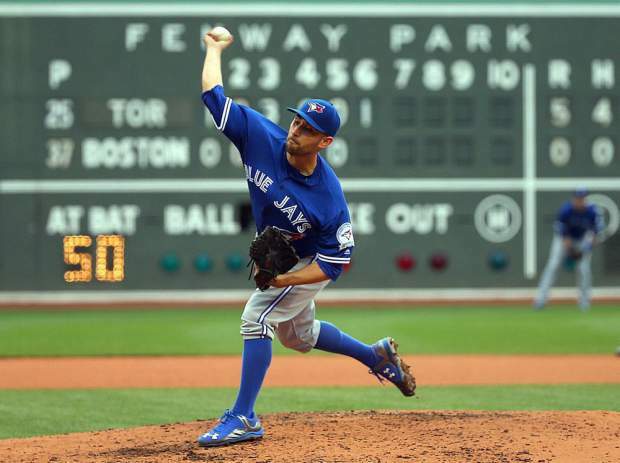 The Toronto Blue Jays were looking to get a win in hopes of staying alive in the series in hopes of going back to Kauffman Stadium to clinch down the road. For now, the Jays needed to take it game by game and tonight they sent Marcus Stroman to the mound to compete against Johnny Cueto who would be sent to the rubber for the Royals. Things would get on a roll early as the Royals would strike first off Stroman as Alcides Escobar would manage to get home. It would also be the third game in a row where Stroman has given up the lead run in the first inning. Luckily, there were eight more innings for the Jays bats to wake up and go on display, and that they did. The Jays would score three runs in the second thanks to Troy Tulowitzki going deep scoring Encarnacion and Colabello. 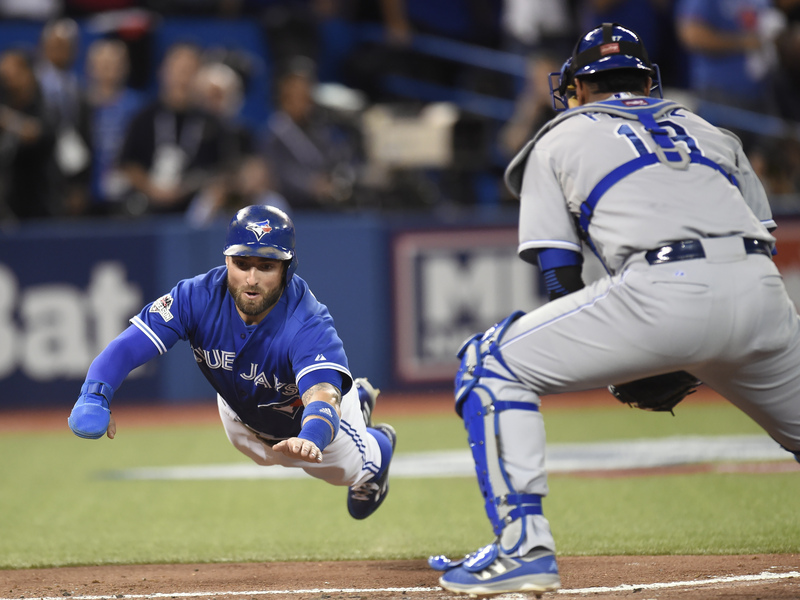 After Russell Martin would come in thanks to a double from Kevin Pillar, MVP Candidate Josh Donaldson would step up to the dish and he would not disappoint. He would go long making it a 9-2 game. After just two innings, Cueto would get pulled with chants filling the Rogers Centre “We Want Cueto”. Heading into the fifth, Ryan Goins would score his first post-season home run of his career. Marcus Stroman pitched into the seventh, as he would be in search of his first post-season win as well. He would go 6.1IP, giving up only four runs on eleven hits. In the eighth, Tulowitzki would complain about the strike zone, as he would eventually get ejected after continuing to chirp the home plate umpire, as he would go out to play defensively. After the game and evaluating the situation, a lot thought that Tulowitzki was selfish as he got ejected in what could have been an extra innings game. Top of the ninth though, the Jays would be looking to close it out, however the Royals put all the nitro in their tank in hopes of coming back. They would score five runs, but would fall short, losing 11-8 to the blue birds. The team would be able to breath a bit of relief as they now have one win under their belt, and hoping for a second one Tuesday afternoon. Game 4 of the ALCS will take place Tuesday with first pitch at 4PM. R.A. Dickey (11-11) will be sent to the hill as he will be countered by Chris Young (11-6).